Our house Gîte Bellevue is situated on a small hill on the outskirts of a quiet village 67220 Breitenbach / Villé, near Sélestat and the wine trail, about 45 minutes from Strasbourg and 30 minutes from Colmar. 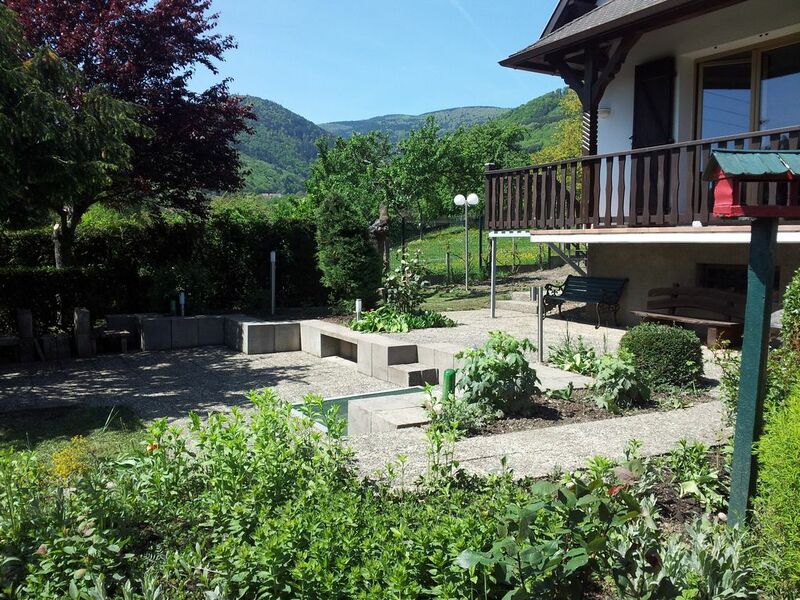 Right at the foot of the Vosges enjoy a magnificent view of the surrounding mountains. From here you can also hiking and in winter a nearby ski resort offer (8 km). Hiking trail on site and all the maps with directions in the region are Available. The bakeries can be reached in less than 5 minutes on foot. Shopping (Super U, Lidl, Norma ... etc.) Can be reached in 5 minutes by car. The cottage Gite Bellevue has 2 terrace and a large garden 3000 m² with beautiful fruit trees. The house has a living area of 140 m² living space, 3 bedrooms, 2 bathrooms, 2 living rooms and complete kitchen facilities. (*) at pet, supplement house cleaning duty). included. Garden furniture, parking in the yard. We were warmly greeted to this beautifully located holiday home. It is in a village setting, with a gorgeous garden and stunning views, and yet a short drive to the main transport links, so is ideally situated. The house and garden are both large, and well equipped. Lovely outdoor furniture. Indoors, some aspects are a little dated, (mostly the 2 bathrooms and crockery), but the house is very comfortable, with good quality bedding, towels etc. We spent a most enjoyable week here, and found lots of interesting things to do. We hope to return in a couple of years' time, as we found it very suitable to our needs. It's great that it is dog-friendly. We would highly recommend this holiday home. we were 3 people staying for a week in this lovely village. The house was really nice with plenty of room and very clean. Wonderful views from the house and a very big garden. we loved seeing the donkey and horse and cow in the field next door and really enjoyed eating the cherries from the garden. Great walks from the village.Only a short drive to the many beautiful villages of the area.Comfortable beds were a bonus. we hope to return for another holiday. Belle maison avec grand jardin et une belle vue panoramique. Belle maison spacieuse , très bien située dans le village. Breitenbach / 67220 Villé is located just 40 minutes from Strasbourg, European capital. Discover our beautiful region. You are here on the edge of the Rhine valley, at the foot of the Vosges Mountains, not far from Sélestat and the wine trail.